You Have a Preemie: Now What? That’s the text message I got in the middle of the night from my son’s birth mother. Just 29 weeks pregnant, she was being wheeled into the operating room for an emergency cesarean section. Of all the possibilities I imagined when thinking of becoming a mother, parenting an extremely premature child wasn’t even on my radar. But there I was, rushing to buy a ticket on the first plane out, flying across the country to the baby who would become my son, begging the flight attendants the whole way to let me get off the plane first. I peeled out of the airport parking lot in a rented car and broke pretty much every traffic law known to man on the way to the hospital. I peppered the nurses with questions about what my son looked like. I was terrified, and I wanted to be prepared. I know now that nothing can prepare you for the sight of your premature child in the neonatal intensive care unit (NICU). My son weighed two pounds, eight ounces when he was born. He was in the NICU for 73 days. It was a roller coaster of emotions and medical treatments. Today he is a happy, outgoing four-year-old. September is Neonatal Intensive Care Awareness Month, honoring tiny warriors like my son and the dedicated team of doctors, nurses, and specialists who save their lives. I’m doing my part to raise awareness with a few things you should know if you have a premature child or if you are the friend or family member of a premature child. Realize that premature babies look nothing like what you see on TV. There have been many preemie plotlines on television, from Andrea Zuckerman’s daughter on Beverly Hills 90210 to the son of Rainbow and Dre Johnson on Black-ish. Although the storylines may be well done, there is no way they can accurately re-create the NICU experience. Babies born extremely prematurely may have skin that appears bright red or even translucent. They will also be extremely thin because their baby fat has not developed. I’ve heard them lovingly described as looking like little old men or cornish hens. Pro tip: these things are only OK to say if you are the parent of a premature child. Know that you may not be able to hold your child for days, or even weeks. My son was too medically fragile to be handled more than medically necessary in those first few weeks. He didn’t even get the birth goo wiped off for a couple of days. Their nervous systems are not yet developed, which means the slightest stimulation, even the stroke of a finger, can send them into distress. I was taught to touch him in a few very simple ways: with two fingers at a time, not moving; with one hand cupped around his head and the other around his tush; and with him holding my finger. We did that for hours a day, until my arms ached from being stretched inside the incubator. His skin was so thin and sticky, I was afraid I’d tear it. Very premature babies won’t be able to wear clothes, so don’t worry about finding anything that fits. They often can’t handle the stimulation, and the medical staff needs to be able to get to their bodies, tubes, and wires instantly in case of emergency. Write things down, especially in the early days. Those first 48 to 96 hours are a total blur. You are walking around looking like a deer in headlights. As a Solo Mom, you don’t have the benefit of a partner to remember things for you. Ask someone at the hospital for a notepad and a pen, and carry it with you. You will eventually become very well versed in complex medical terminology, but for now you need help. Ask questions. Ask the nurses to draw diagrams to help you understand. When my son had to be intubated and put on mechanical ventilation, and I found out that he had a hole in his heart (all in the same day), the neonatal nurse practitioner on duty drew me a diagram of the heart and lungs to show me exactly what was going on. As she spoke, I could only nod through my tears, but I studied that diagram later. Also, try to write down the baby’s progress or lack thereof for things such as weight and length, heart and respiratory rates, food intake, and oxygen saturation. This will help you later on when you discuss treatment with his medical team. Follow NICU rules of etiquette. My son’s hospital provided me with an etiquette tip sheet on our first day there. It was very helpful and made sense. It included rules such as keeping your eyes on your own baby. As the mother of a premature child, you will find yourself becoming protective in a mama bear way of anyone gawking at your baby like he or she is a sideshow. So do the other parents and babies a courtesy of focusing on your own child. Another rule of thumb was to leave other parents be. Sure, it’s only natural to strike up a conversation as you are all going through the same thing. But that’s OK only if the feeling is mutual. You are not there to make friends. Also, stay off your cell phone while in the NICU. Put it on silent or vibrate. If you must take a call, step outside. I did FaceTime with friends and family a few times, but only when I was the only parent in the NICU. Treat NICU nurses like the national treasures they are. My son’s neonatologists were fabulous, and they played a large role in my son’s health. But the nurses and nurse practitioners became our lifeline. These are the women (and men!) who save your child’s life. They are the people who know everything about your child, from his complex medical history to the way he likes to be held. They will get to know you well. Be nice to them. Bake them brownies, or ask a friend to bake them brownies. Bring them bagels, or ask a friend to bring them bagels. If you get coffee, bring them coffee. Remember, they are always hungry, they are always in need of coffee, and they always have to pee but are taking care of someone’s baby before they do. Treat them like gold because that’s what they are. If you are as lucky as I was, they will become a permanent part of your family. My son and I regularly stay in touch with his NICU nurses, and a special few have become close family friends. Ask for help. This sounds so simple, but it can be complicated. After your child goes into the NICU, your phone, e-mail, and text messages will be blowing up with people wanting to help and wanting to know how you and the baby are doing. That’s the good part. Being inundated with all those phone calls, e-mails, and text messages is the bad part. I handled it two ways. First, I created an e-mail list for my family and friends, and I sent an e-mail once a day at first, then once every few days. On days that were just too emotionally difficult (and there were several), I designated my mom to be the messenger. I talked to her, and she relayed the information I wanted shared with a note asking others to give me space and privacy. I also asked everyone who wanted to buy him something to hold off. I didn’t want a houseful of baby things in case the worst happened. Also, I was living in an extended-stay hotel 1,300 miles away from home, and I had no way to get all of it home without paying huge shipping fees. What I did need: support. That came in the form of my mom flying down for two weeks in the beginning, then for a few days about six weeks in, and then again to help us get home. My aunt flew down for a week. My other aunt and uncle came for a weekend. Two of my cousins came for a weekend. They will never know how much I needed them. One of my friends sent me a 56-ounce bag of M&Ms. One of my cousins had my favorite cookies shipped to me from my favorite New York City bakery. My best friend sent me a card and a photo album full of silly pictures taken over the course of our 20-year friendship. And when it came time for my son to start wearing some clothes in the NICU, one of my cousins went to H&M to find outfits that matched the NICU specifications in his size and mailed them to me. One friend took my dogs in, no questions asked. My other friends dropped everything to talk when I called or texted. My community was simply wonderful. Take lots of pictures and videos. I only have a couple of pictures from the day my son was born, and I treasure them. Each of us should have pictures of our baby’s first few days, NICU or not. If you are not comfortable sharing his picture with the masses, get a shot of his tiny hand in your hand or her tiny feet. That’s what I did for my office until I was more comfortable sharing his photo. 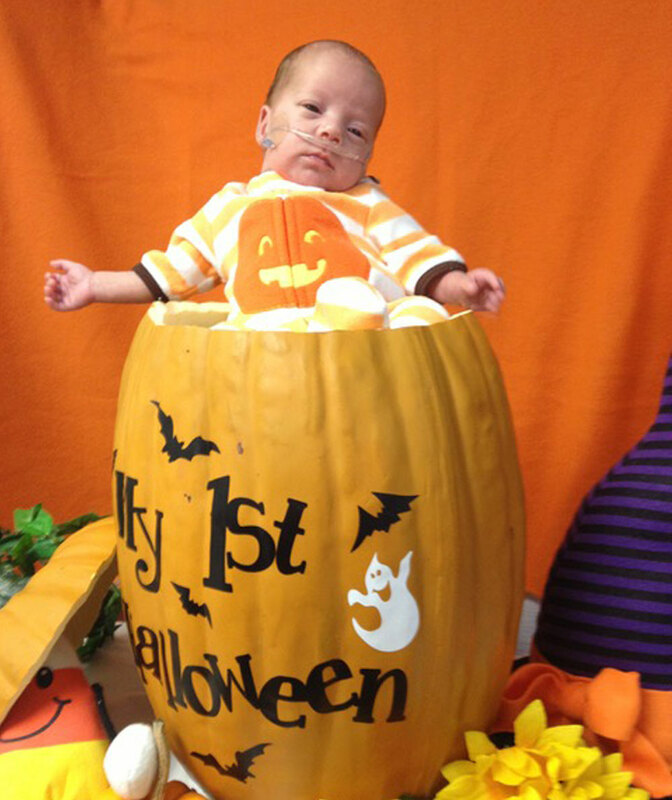 My son was in the NICU for his first Halloween. I found a preemie pumpkin onesie and cut holes in it for his feeding and oxygen tubes. One of his more crafty nurses set up a fake pumpkin and stuck him in it, ducking behind the pumpkin to hold him and his head up. I also made a point to make signs and do a mini photo shoot for his one-month and two-month birthdays. The day he was discharged, I put him in an oversized three-piece suit and took more pictures. Remember to get yourself in the pictures, too! As long as they aren’t busy caring for patients or charting, the nurses will be happy to get some shots of the two of you. Wear your NICU pride like a badge of honor. Being the parent of a NICU baby is a club no one wants to be a part of. But once you are initiated, be proud of your child and how hard he or she has worked. Be proud of yourself. You can do this. In those hard moments, reach out to our community in Sisters Only. You will find Sarah and other Solo Moms who’ve been there.